Who is Wendy and why is this dinosaur named after her? WASHINGTON (Reuters) - It's not every day a dinosaur gets named after you, so Canadian fossil hunter Wendy Sloboda celebrated in a unique way. "I got a new tattoo of my dinosaur recently to show it off. 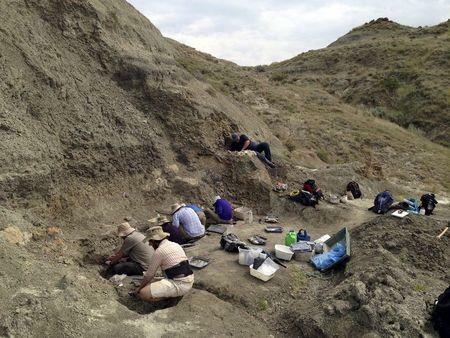 It is pretty exciting for me," said Sloboda, who first spotted the fossils of the dinosaur now named Wendiceratops in southern Alberta's remote badlands. 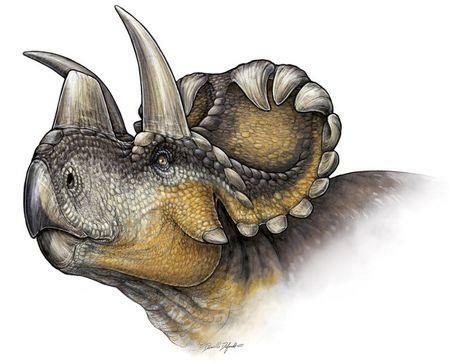 Scientists on Wednesday announced the discovery of Wendiceratops, a 20-foot-long (6-meter) two-ton beast with a prominent, upright horn atop its nose and a series of short, forward-curling hooks adorning a bony, shield-like frill at the back of its head. They said Wendiceratops, which lived 79 million years ago during the Cretaceous Period, provides insight into the early evolution of horned dinosaurs, a prominent group of four-legged herbivores including the well-known Triceratops that lived near the end of the age of dinosaurs. "Wendiceratops is a truly eye-catching dinosaur. With its array of gnarly horns curling forward off the back of its frill and its tall nose horn, it is without a doubt one of the most highly ornamented members of the horned dinosaur family, which is well-known for their spiky skulls," paleontologist David Evans of the Royal Ontario Museum in Toronto said. Wendiceratops lived in a lush, warm coastal plain near the inland sea that bisected North America at the time, cropping plants with its parrot-like beak. "We suspect that the skull ornamentation may have been a visual cue that allowed these animals to recognize each other over a long distance," Cleveland Museum of Natural History paleontologist Michael Ryan said. Sloboda in 2010 spotted fossils including parts of the frill sticking out of a mud rock layer at the bottom of a steep hill just north of the Montana border. 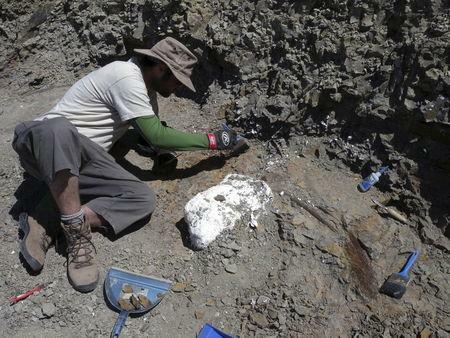 Fossils of three adults and one juvenile Wendiceratops have been identified. "Wendy is one of the most talented dinosaur hunters in the world. She has a sixth sense for finding important fossils," Evans said. Sloboda has scoured far-flung locales including Argentina, Mongolia, France and Greenland and made her first important fossil finds as a teenager. She can be reminded of Wendiceratops, meaning "Wendy's horned face," every time she looks at the tattoo on her forearm. "It is every fossil hunter's dream to have a specimen named after you," said Sloboda, who works as a paleontological technician searching for, excavating and preparing fossils for study. The research appears in the scientific journal PLOS ONE.